Today, a wide variety of door styles offer as much form as function in a garage. 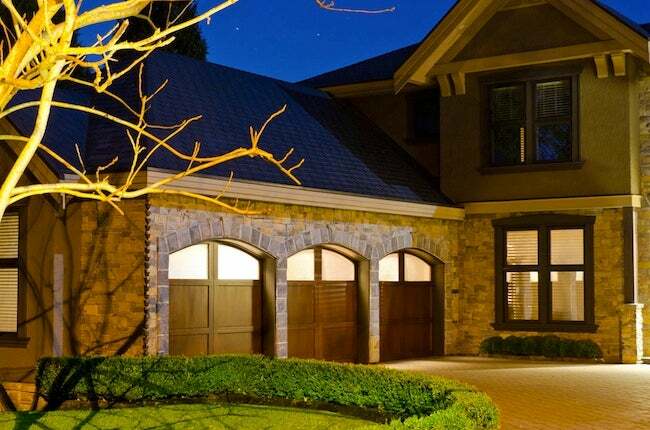 Consider a new garage door for added style and energy-efficiency in your home. Garage doors may not seem like great decorating opportunities—most people treat them as functional afterthoughts that just need to open and close on command. But today’s options in garage doors include a wide variety of styles that add a handsome touch to your home. In fact, a recent home improvement survey showed that a garage door upgrade was one of the top five projects in terms of return on investment when it comes time to sell your home. You can find all kinds of garage doors that look like barn doors or carriage house doors, even doors in Mission style or more sleek contemporary styles. These new doors can look like wood even if they’re made of steel or fiberglass. Best of all, they may appear to be traditional side-hinged doors but are actually overhead doors that can be controlled with a remote or a pushbutton. If your garage is attached to your home, here’s more good news: Today’s models are much more energy-efficient than older ones and save you money on your heating and cooling bills, too.